Between Utah State University’s Smith Spectrum and playing a Sweet 16 team in recent weeks, Mercer head coach Bob Hoffman has been around some high-profile college basketball recently. The Aggies and the Florida Gulf Coast Eagles, history’s ultimate Cinderella team that is still in the NCAA Tournament, have been common opponents for Hoffman’s teams. The Bears defeated USU in last year’s CollegeInsider.com championship game in Logan, while they faced the Eagles three times in Atlantic Sun competition this year. They lost two of those, including an 88-75 decision in the conference tournament championship March 9 at their home court in Macon, Ga. By virtue of the win, FGCU gained an automatic berth to the Big Dane, where they have now sent ripples throughout the nation by becoming the first 15-seed to make the Sweet 16, beating Georgetown and San Diego State in Philadelphia along the way. Following a loss March 25 at BYU in the National Invitational Tournament, the five-year Mercer head and former NBA Developmental League coach offered comparison between the two contemporary programs. Mercer coach Bob Hoffman during this season’s NIT loss to BYU in Provo, Utah. Hoffman said the USU team his club faced in the CIT title last year and this season’s Sweet 16 darling Florida Gulf Coast differ drastically in playing styles. He also knew former Aggie point guard Brockeith Pane in the star’s high school days. Compare Utah State and Florida Gulf Coast’s playing styles. Florida Gulf Coast pushes more; they get it up the floor quicker. They will run sets, but that’s their last option on a possession. They’d rather get out and go and get 3-on-2’s, 2-on-1’s. They are completely different in style. To me, Utah State’s more like us in style, with half-court sets. What were some keys to win in the Spectrum? The individuals we had with high character and the experiences prior to that game for us to be successful as we were. FGCU point guard Brett Comer is creative with a high assist average (6.6 per game). How much does he compare with (former USU point guard) Brockeith Pane? Brockeith is a lot stronger and shoots the ball better. (Pane shot 43.5 percent as a junior to Comer’s 40.7 this season, and 30.2 from 3-point range as a senior compared to Comer’s 26 percent this year). He has more of a midrange game. Comer is more of an assist-first and flashier. Brockeith is a good passer, but he has more of a scorer’s mentality from that position. Comer’s trying to pass at all costs. Both of them do a good job running their teams, but you’ve got to honor Brockeith’s ability to score all over the floor. He’s that way in general. When he was growing up, I was in Oklahoma (an assistant at Oklahoma University), so I saw him in high school in Dallas (Carter HS). I think he’s that good a player in scoring, but you might be right because of what had transpired with that team in the midst of that. Sherwood Brown (FGCU’s leading scorer and this season’s A-Sun Player of the Year) has been a big deal in the NCAA Tournament. He’s been a great rebounder for his size (6.6 per game this season at 6-foot-4). Was there anyone at USU who was that effective in that category last year? I don’t really recall. He is a special talent because he can play inside and outside (Brown shoots 38 percent from the field), is explosive on the bounce and get finishes, in the midst of his rebounding. He seems to get better every year (his scoring, rebounds and assists per game have increased each season), and they’ve done a great job in working with him on his skill set to play at the level he’s playing at right now. Guard Bernard Thompson averages three steals per game, is a 38 percent 3-point shooter this season and is 6-foot-3. Is he a valid comparison to Preston Medlin? Preston is a great player. I like his game. He hit all kinds of big shots for you guys, and for (FGCU), Bernard Thompson might have hit the biggest shots for them to date (in the NCAA Tournament). When Brown was in foul trouble, he made some big plays in both those games. He’s an inside-outside guy. Preston‘s ball-handling might be a little better, and he might be tad bit more explosive. But with the ability to hit some big shots, they are definitely in the same category, no doubt. 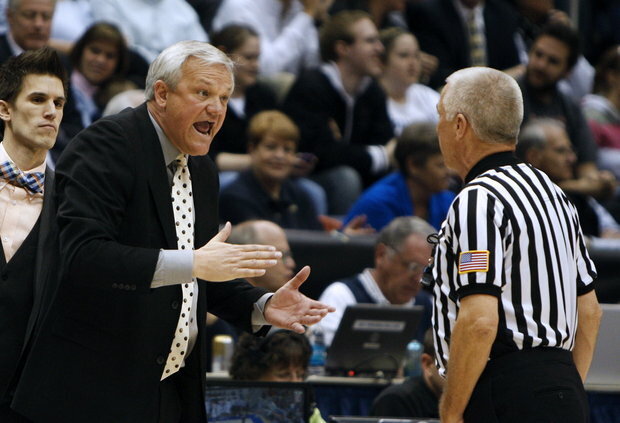 How do each team’s head coaches (USU’s Stew Morrill and FGCU’s Andy Enfield) compare? I think both of them are great at using their strengths to whatever their talent level is. Coach Morrill, he’s done it all kinds of years with all different kinds of players. Andy’s first two years, he’s taken this group with what they do best and put them in a position to be successful. I think that’s what any good coach does. Coach Morrill’s done that at a high level for a lot of years. Their coaching styles are completely different in terms of their on-court presence and style being different. But what they try to accomplish is the same in trying to help each of their players to be successful. What of each coach’s on-court presence? I haven’t seen everything about Coach Morrill, but I think he’s more of a calming influence. He will get upset from time to time, but he will do his coaching in the midst of the game, when (getting upset) just happens. Andy does that to a degree, but he just is yelling at his guys and more in-your-face kind of a thing. Not in a bad way, but just different motivation styles. But Coach Morrill says he’s calmed down from earlier in his career. Florida Gulf Coast did lose 10 games and you beat them for the regular-season title. It’s hard to believe they are actually this good. Is this a real thing? No, I do believe they are a very good team. Belmont was really close against Duke (a 77-76 in the Blue Devil’s season-opener at home in Nov. 2011). Our league has had some really good teams, winning some games against other BCS teams, with all kinds of wins on the road. (The Bears won at Alabama and Florida State of the SEC and ACC, respectively, this season. The teams had RPIs of 62 and 82 after the regular season.) So a culmination of that—and on top of that, I think they’ve had good matchups for them, and they’ve played well, and their confidence has been at a high level for them to succeed like they have. I mentioned right after we lost to them that they could win some games in the tournament. I thought we would have if we had a chance to be in it. When you are on a neutral floor, it’s completely different than all those other tournaments when you have to play against the home court side. On a neutral floor, it’s all about momentum and emotion of crowd. They have been able to get the crowd behind them in both games they’ve played. It’s given them a big boost; it’s almost become home court advantage. That’s amazing to gain such an advantage like that against Georgetown. I don’ think it’s that unusual. When a lower seed starts a run, the other team’s crowds get excited to (cheer) because they always want to see the highest seed go down. Would you prefer to coach against a style against USU or against a few times against FGCU? No, not really. I enjoy coaching against all styles and preparing for different schemes. I don’t have a preference. I enjoy the opportunities when you get pushed to the maximum—no matter how much you get pushed. We were fortunate to win a lot of games this year and compete in lots of others, and that’s how when you get stretched as a team and a program. We’ve been blessed that way in the past few years, to be in a lot of games, and that just makes us a better team and program. Predictions about how far the Eagles can take this? No, I’m good on that.